This year will be my first year hosting Easter dinner for my family, and you know me.. I am going overboard. I'm so obsessed with the idea of forming new traditions with this dinner, so every decision has been something that I want to last for years to come. I got Beatrix Potter plates and carrot patterned cloth napkins, some incredibly cute wicker bunny decorations for the centerpiece, and little carrot shaped drawstring bags that I'll fill with goodies for each guest. Every year we go over my grandmom's for Christmas breakfast and I've always loved seeing the same decorations come out each year, the same sugar bowl, the same pastries from a local bakery. I want my family to feel that way about my Easter dinner. Ten or twenty years from now they'll be like "Yay! The Beatrix Potter plates!" or "I was looking forward to your vegetable pot pie all year!" I will definitely take photos and share details about my dinner afterwards, but today I wanted to show you a really easy quick DIY I whipped up! 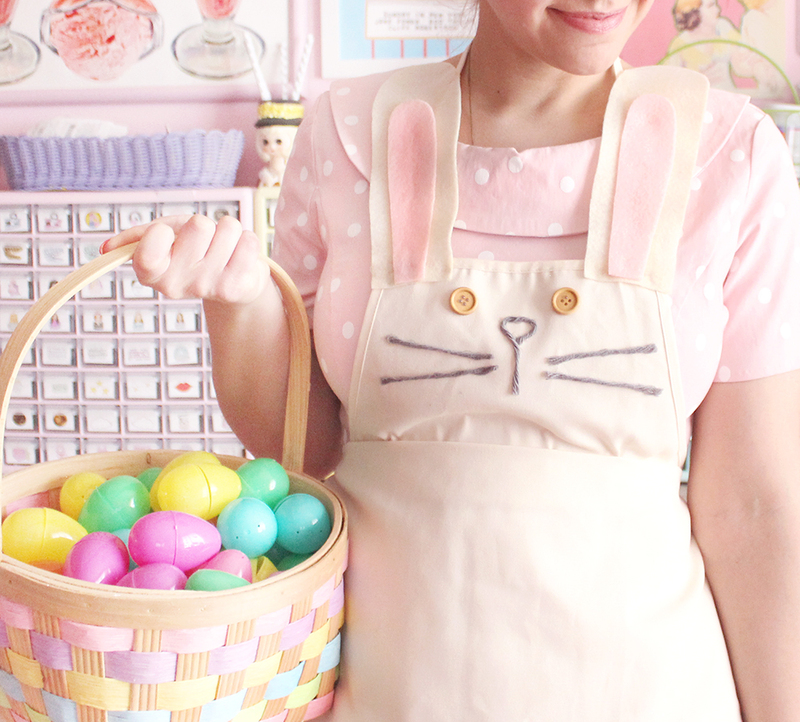 I wanted a cute apron to wear on Easter while I'm cooking, since I'll want to be dressed in my Finest Pastels but I do not want to get food all over them. 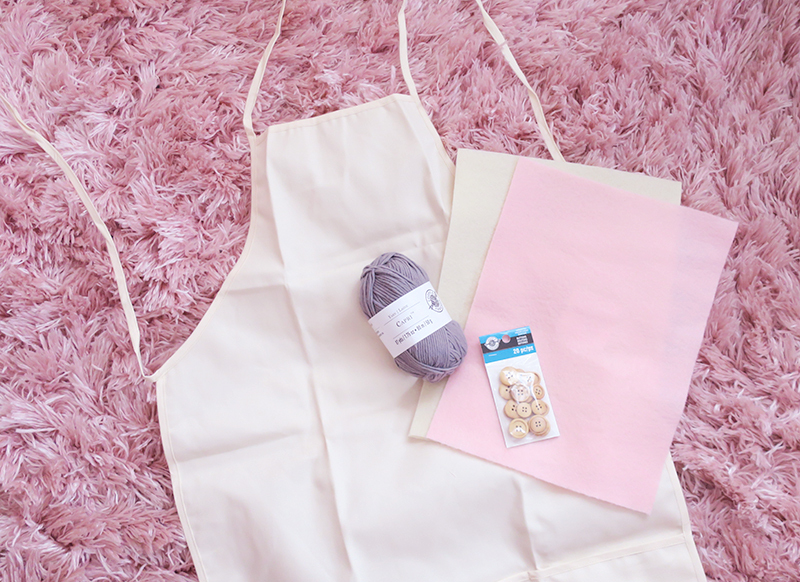 This apron is so incredibly easy to make -- and the only tools you need to make it are hot glue and scissors! 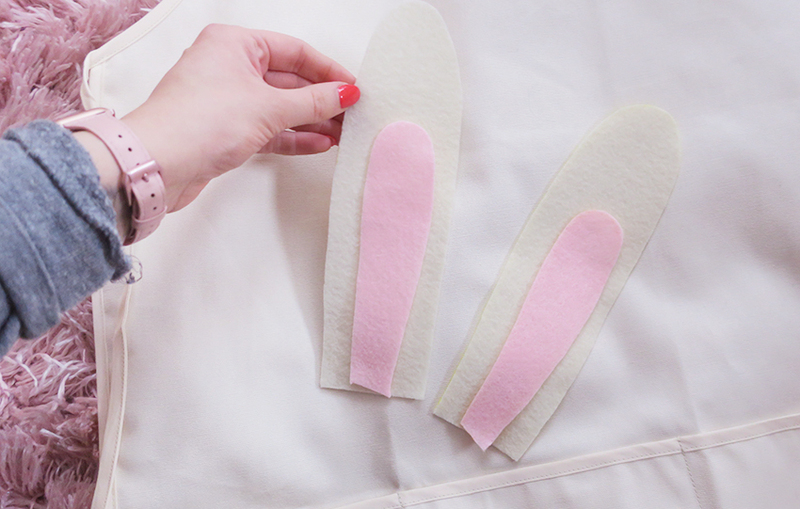 Cut out two bunny ears from the cream fabric, and then two smaller bunny-ear shapes from the pink. Hot glue the pink shapes onto the cream shapes to form your ears! Then simply hot glue the bunny ear pieces onto the straps of your apron (I attached the bottom of the ear to each corner of the apron, and then ran hot glue along the length of strap that the ear would be covering.) Hot glue the buttons on for eyes, and hot glue strips of yarn on to make a nose and whiskers. You could definitely sew this on, too, if you have the right needle for it! I just wanted to whip this up quickly and hot glue was easiest! 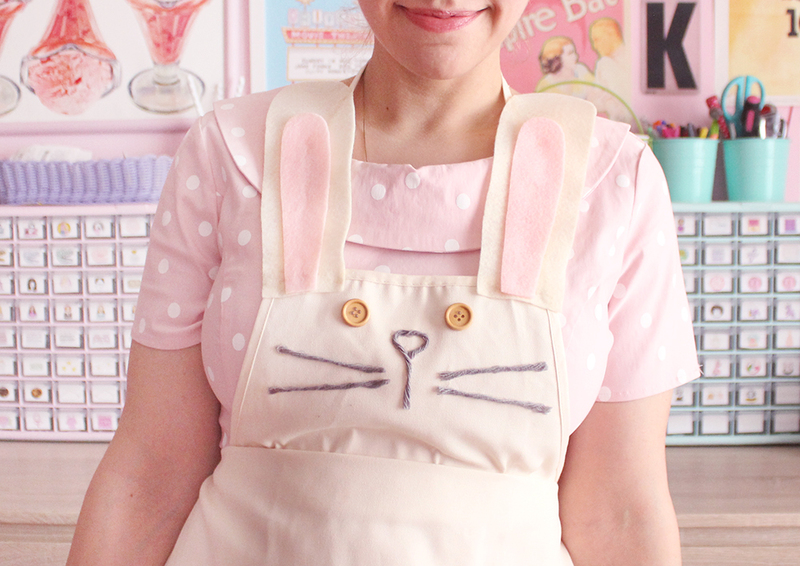 And voila - you have a cute little bunny apron for Easter!